Kerins says that she is leaving because of “the toll that public controversy has taken on the Rehab Group and my own family”. Angela Kerins arriving at Leinster House in February. REHAB CEO ANGELA Kerins is to step down from her role citing toll the recent controversy has taken on her family and the charity. The board of the Rehab Group has been informed of her decision and say that a transition process is being put in place. Kerins has been under increasing pressure since the disclosure that she earns €240,000 annually, as well as revelation that Rehab made a €9,000 profit from €4 million worth of scratch card sales in 2010. 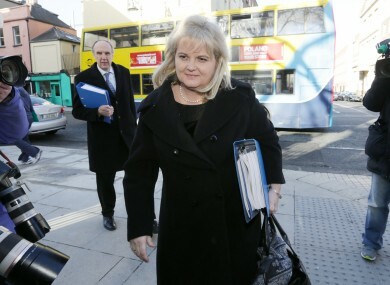 Upon appearing before the Public Accounts Committee in February, Kerins defended her salary insisting that she turned down bonuses she was entitled to, adding that she and Rehab’s staff are not public servants. In recent months, I have become increasingly concerned about the toll that public controversy has taken on the Rehab Group and my own family. While I have dedicated my energies and ability to growing and developing the Rehab Group for the last 22 years I am of the view that it is in the best interests of all concerned that I step down at this time.In doing so I hope the organisation can focus its entire energies on its core activity of developing and delivering services to people with disabilities and others who are disadvantaged. I want to thank my many colleagues for their great support throughout my time in Rehab. I wish everyone, the people who work for Rehab and the people who use its services, all the very best. After Kerins’s appearance before the PAC, Rehab came under further pressure when its former director and Fine Gael strategist Frank Flannery was forced to step down from his position at the charity when money he’d received for lobbying work he’d undertaken for Rehab came into question. Kerins is scheduled appear before the PAC again next week and speaking this morning on Newstalk Breakfast, PAC member Mary Lou McDonald TD says that she still expects her to do so. The board of Rehab have thanked Kerins for her seven years as head of the Rehab group saying that she led the charity with “dedication and resolve”. “During her two decades with the organisation she has always striven to ensure that those who needed its services received the best possible support,” said Rehab Group chairman Brian Kerr. Email “Angela Kerins quits her role as Rehab CEO”. Feedback on “Angela Kerins quits her role as Rehab CEO”.